These DIY Painted Sugar Skull Masks are the perfect Halloween or Day of the Dead Activity to do with your kids! Hello All! Before I go any further, I just wanted to say, “thank you” to Amanda and to all of you for having me earlier in the month. 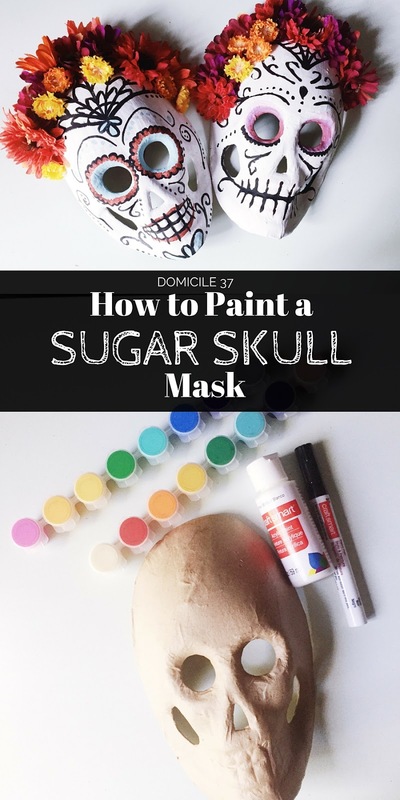 I know October is almost over, but I have been itching to make some sugar skull mask with my kids before October is over. The perfect opportunity arose when we were rained in for almost 2 weeks. As we were preparing for Hurricane Joaquin to storm through the East Coast, I made a mad dash to Michael’s to pick up some paper mache skull mask (I could not help myself they were half off plus I was able to use my coupon for an additional extra off my whole purchase)–you can see where my priorities were, LOL! Since I knew I would be stuck in the house with 3 kids I knew that painting would calm them and keep them contained from messing the house. You can view all of our painted masks, here. 1. Paint mask white and allow it to dry with your regular paint brush. Do not apply thick layers of paint on skull or it will take longer to dry. Paint with an even consistency. 3. With you fine point paint brush make pedal like brush strokes around the painted eye sockets. 4. Add your details to the mouth. Outline the teeth with either your black marker or use black paint. You can even add lips to your skeleton. 5. Add details to your skull’s forehead. You can make spider webs, swirls, whatever you like. 6. Add more detail on the face to fill in the space. Feel free to put a little color on the face or even rhinestones. 7. with your black marker or black paint and the fine thin paint brush outline the colored detail on your skeleton. ***You can stop here or you can go a step further and add fake colorful flowers to your sugar skull and create a headdress by hot gluing the flowers on top of the skull. 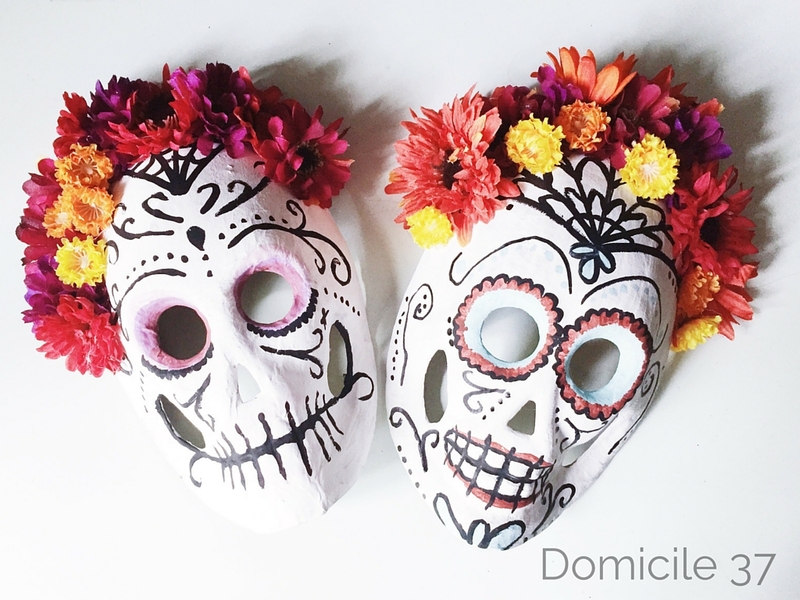 This would make a great Halloween or Day of the Dead Craft Idea! This is one of those crafts that is fun for both kids and adults! 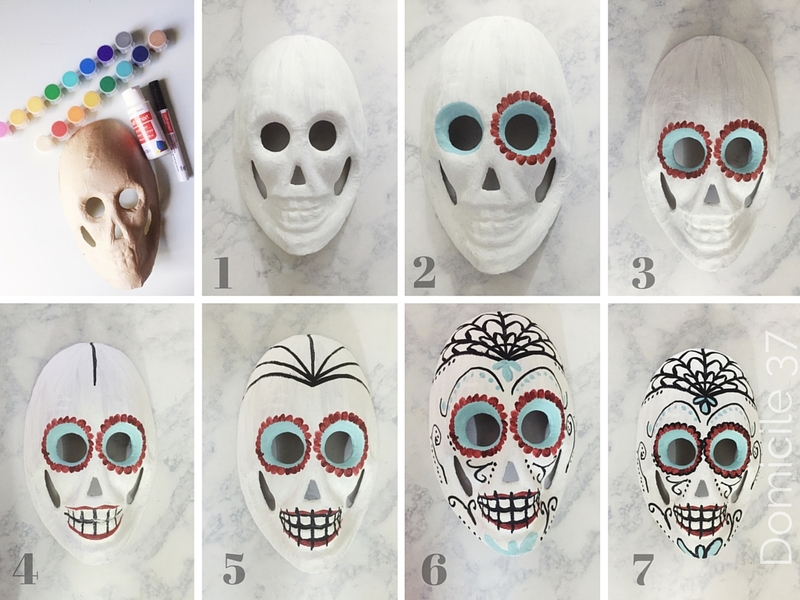 Try this DIY Painted Sugar Skull Mask before this spooky season is over! I love sugar skulls! These two look great, I’m loving all the colors you used. This are SO great. I wanna make one!!! The flowers are the icing on the cake! These are beautiful! You are so crafty! This is amazing! You are crazy talented to do this freehand!